While the West thinks Russia is fighting a war with Ukraine, and Moscow calls the conflict a ‘civil war’, civilians continue to flee the combat zone in eastern Ukraine. Last summer, many people made their way to the border crossing at Rostov, and from there—across Russia. Ukrainians have been coming to work in Russia for a long time. If you take into account labour migrants from Ukraine (of which there are 3.6m), there are almost five million Ukrainians living in Russia. And for many Russian-speaking Ukrainian citizens, Moscow was the only place they could move after the outbreak of war in the east. But how have Ukrainians fared here, in a country where ‘Banderites’ (followers of Stepan Bandera) and ‘supporters of Maidan’ are far from popular? At the start of July, Sergei, 25, who left for Moscow after war broke out in south eastern Ukraine, received a call from the district Prosecutor’s Office. They invited Sergei to give evidence as part of a criminal investigation into war crimes committed by the Ukrainian military in Donbas. If Sergei didn’t co-operate, they said sternly, he would be issued a summons. 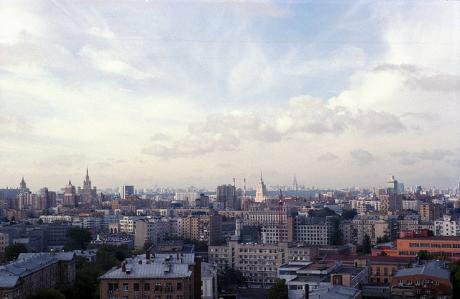 Moscow sky-line. Yuree Markevich / Flickr. Some rights reserved. ‘The questions were like: have you heard anything about the use of weapons, which aren’t sanctioned by the OSCE? Have I, my property or my family suffered as a result of the war?’ remembers Sergei. Sergei comes from the port city of Nikolaev (Mykolaiv) on the Black Sea coast, and he is sure that the prosecutor’s office found his telephone number via the Federal Migration Service (FMS), who have a record of him. ‘They didn’t ask any informal questions, they just asked me what I plan to do next,’ remembers Sergey. Sergei left his home town of Nikolaev just as the draft was kicking in. Indeed, despite the fact Sergei was a student and is exempt from military service, a draft summons was delivered to his address shortly after he moved to Moscow. Sergei tells me that many of his acquaintances fled to Moscow to avoid the draft. People are sympathetic to his plight, he notes, when he tells them where he’s come from and why he left. 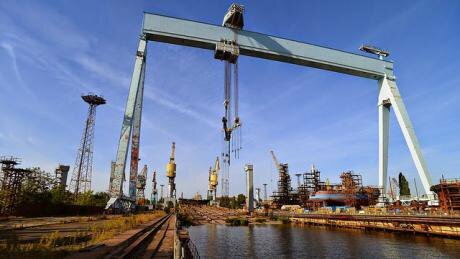 Nikolaev is a rail and sea transport hub on Ukraine's Black Sea coast. Torpedolov Ukraine / Flickr. Some rights reserved. However, in a new town, and with Ukrainian citizenship, people aren’t having much luck when it comes to jobs: they have to choose between working as a loader or a courier. Employers want Russian citizens. For them, Ukrainians are labour migrants just like citizens of Kyrgyzstan or Uzbekistan—the traditional means of low-skilled labour. As a result, Sergey hasn’t managed to find a job, and now makes his money by busking. Regardless of the conflict in Ukraine’s south east, Sergei doesn’t consider himself a ‘traitor’, although he admits that his friends who stayed behind have called him one. ‘They called me a renegade, of course. I had one really unpleasant conversation with a neighbour when he saw a picture of me on Red Square. Another one asked me not to shoot at them after I’m called up to the DPR [Donetsk People's Republic] militia, but I’m not planning on joining them at all.’ Sergei was never interested in politics, and saying that he isn’t planning to return to Nikolaev any time soon. So far, it seems the Prosecutor’s Office is only searching for witnesses in Moscow. Refugees living in other cities have not been questioned. For instance, Tatyana Sukhinova, 34, who now lives in the small village of Luknovo some 300km east of Moscow. Originally from Amvrosievka, a town halfway between the Russian border and Donetsk, Tatyana is from a mixed Russian-Ukrainian family. Tatyana Sukhinova with her daughter. Image courtesy of the author.Amvrosievka has been shelled since 15 June 2014 (both sides have blamed one another). Tatyana decided to evacuate after a shell hit her home. ‘I remember the border crossing clearly, the moment itself. Back then loads of people wanted to get across in time—some by bus, others by car. People, including us, were traveling without even knowing where they were going. Tatyana arrived in Moscow a month later, and migration service officials requested she fill in a pile of documents. She had to negotiate a place for her children Snezhana and Valentin on her own. ‘It was only thanks to some good people that my children didn’t have to sleep on the street, and I could get my bearings,’ Tatyana recalls. After the humanitarian catastrophe in Donbas, when thousands of people made their way to central Ukraine or neighbouring regions in Russia, numerous volunteer initiatives were set up to help refugees. For several months, refugees from the war lived in tents while volunteers identified potential housing for them. Several of these projects are also involved in supporting the unrecognised republics in Donetsk and Luhansk. Today, Sofia, Tatyana’s 14-year-old daughter, is waiting for her mother in Rostov, the largest city near the border between Russia and Ukraine. When the refugees tried to cross, the border guards didn’t let Tatyana’s older daughter through: Sofia has her father’s surname, and she didn’t have a document certifying his permission. Soon, Tatyana will go to Rostov to collect her daughter, and then on to the border crossing in order to extend her migration card, otherwise she faces a fine. Tatyana also has to travel to Amvrosievka to receive her children’s school certificates: without them, Sofia will have to repeat the seventh grade. Meanwhile, Tatyana has to receive a temporary residence permit before September. She has to undergo a medical examination and sit exams on Russian history, language, and literature. Tatyana earns 5,000 roubles (£52) per month working as a seamstress at a linen factory, and she earns extra, waitressing at two Tatyana at work. Image courtesy of the author. cafes on the highway. Here, she receives 350 roubles (£3.70) a day for waitressing, washing dishes and cleaning. ‘The hardest thing in my life is losing everything: home, friends, family,’ Tatyana reflects. ‘And to find yourself in another country where nobody needs you, apart from your children. Here in Russia, wherever I work, there are people who say we’re [Ukrainians] the reason there’s a crisis in Russia. And now we’ve come in droves, asking for help. Many refugees or the volunteers who help them refused to comment: they’re afraid of ‘provocations’. ‘This is all fascism,’ says Anastasiya Bykova. ‘Fascism, that’s the current situation in Ukraine.’ Bykova, 27, left the town of Slavyansk (Slovyansk) with her children after the separatists surrendered the town in July 2014. Anastastiya Bykova (centre). Image courtesy of the author. 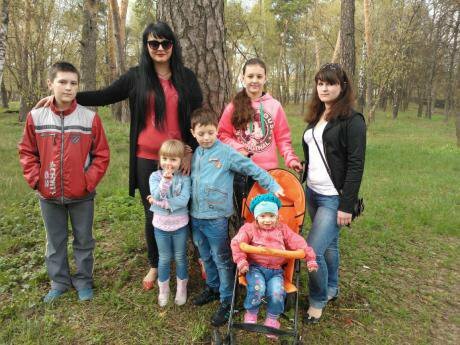 Now, Anastasiya lives with other refugees in Serpukhov, a small town between Moscow and Tula. Despite her Russian sympathies, Anastasiya was denied official refugee status, and as a result she cannot find permanent employment. But the Prosecutor’s Office decided to get in touch all the same—perhaps given how close Serpukhov is to Moscow. ‘Our conversation started with a request to inform them of the last 10 years of my life, right up to how old I was when I gave birth, who the father was, why we divorced, what I’d lost and how I got here. It is not only Ukrainian refugees that are finding life difficult. In late July, Russia’s Federation Council publicised the so-called ‘patriotic stop list’, which declares 12 organisations ‘undesirable’, invites the justice ministries to investigate their activities, and stipulates fines and even prison time for people co-operating with them. Aside from Open Society Foundations and the National Foundation for Democracy, the Ukrainian World Congress (Toronto) and the Ukrainian World Coordination Council (Kyiv) were also included on this list. The Ukrainian World Congress has partner organisations in 34 countries, including Russia. Vladimir Girzhov. Image courtesy of the author. These developments have left some people in an uncertain situation. As Viktor Girzhov, co-chairman of Ukrainians of Moscow, explains, the Congress and Council co-ordinate activities all over the world, including a partnership with his organisation. Girzhov says that his group’s relationship with these organisations is no more than a partnership, and as part of this, he travels to meetings once a year. Girzhov doesn’t receive a penny from foreign funding, and the last grant was given to hold a cultural festival in 2009. ‘You need to look at things how they really are, we’re not involved in any subversive activities,’ says Girzhov. ‘But now they’ve searched the library of Ukrainian literature. The Ministry of Justice has refused us registration twice. We don’t doubt that they’ll refuse us again. Everyone, it seems, has decided to lay low. No demonstrations are being held. Activists say that many people from Ukrainian organisations have left the regions, places like Tatarstan and Ekaterinburg. Girzhov says that the authorities are yet to demand demonstrations of loyalty from local Ukrainians. Instead, public officials are concerned only with preventing conflict. Girzhov is a frequent guest on Russian state television. Indeed, it’s thanks to Girzhov that discussion on talk shows is possible: often guests come on with exactly the same position.